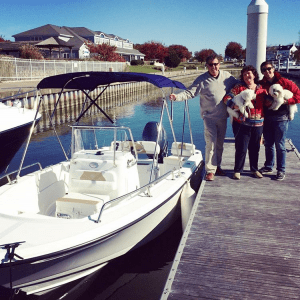 Congratulations to Rose Magness, the new owner of this brand new EdgeWater Center Console 170CC, the Grand Prize at the 2016 United States Powerboat Show sponsored by Annapolis Boat Shows, EdgeWater Boats and Annapolis Yacht Sales! In 2016 to Celebrate the 45th Anniversary of the United States Powerboat Show, the Annapolis Boat Shows, Annapolis Yacht Sales, and EdgeWater Power Boats Gave Away an Edgewater 170CC Deep-V Center Console Powerboat. This was just one of many center console fishing boats that were on display at the Powerboat Show. 1. Purchase your 2017 United States Powerboat Show tickets online today to be automatically entered to win the 2017 Grand Prize, which will be announced later in 2017.